A 5-year-old male child presented with history of dull aching chest pain for the last 3 months. It was associated with low-grade intermittent fever and nonproductive cough for the last 20 days. The child's birth history was uneventful, with a birth weight of 2.8 kg, and he was fully immunized as per the schedule. On examination, the patient was sick and pale, with a pulse rate of 136/min. The respiratory system examination revealed bilaterally clear chest. On precordial examination, the heart sounds were soft and feeble. An abdominal examination revealed palpable liver, which was 5 cm below the costal margin. On hematological investigation, hemoglobin was 10.5 gm%, with a white blood cell count of 6.0 x 10 9 /l and a platelet count of 350 x 10 9 /l. The chest radiograph revealed widened mediastinum. An echocardiography suggested a large cystic lesion occupying the anterior mediastinum and compressing both the right and left ventricles and the right atrium. On contrast-enhanced computed tomography (CECT), a large cystic mass in the middle mediastinum was identified. It was seen extending from just above the arch of the aorta and up to the diaphragm. The cyst was displacing the great vessels, trachea and heart posteriorly [Figure 1]. Both the lung fields were clear and the heart chambers were normal in size, but were compressed posteriorly. The differential diagnoses of thymic cyst, lymphangioma, hydatid cyst and pericardial cyst were considered. The cyst was excised by median sternotomy. A large pericardial cystic structure measuring approximately 10.0 cm x 9.5 cm x 9.0 cm was seen loosely adherent to the pericardium [Figure 2]. Its outer surface was glistening and was filled with clear fluid. Histopathological examination revealed the structure of a cyst lined with flattened mesothelial cells suggestive of pericardial cyst. The postoperative period was uneventful and the patient is doing well in follow-up. Pericardial cysts are uncommon mediastinal abnormalities that are usually congenital but may also be acquired after a cardiothoracic surgery. They may occur in patients of all ages, but commonly present in adults. These are quite rare in childhood and are mostly asymptomatic. Symptoms, if present, are usually because of compression by the cystic mass. Chest pain, dyspnea and paroxysmal tachypnoea are the most common symptoms that are found in 25-30% of the patients. Other symptoms a patient may report are epigastric fullness, airway obstruction, asthma, venous obstruction, etc. However, cyst rupture, cardiac compression, atrial fibrillation and even sudden death have been reported. These lesions are usually detected on a chest radiograph performed for some other cardiopulmonary reasons. These intrathoracic masses on chest radiographs appear as cardiomegaly. Asymptomatic patients with pericardial cysts should be managed conservatively. , Treatment is required in symptomatic patients or in those with unclear diagnosis. The indications for resection of pericardial cysts are large size, symptoms, uncertainty of malignant potential and prevention of life-threatening emergencies. The various treatment modalities include percutaneous aspiration of cyst, ethanol sclerosis, surgical resection or video-assisted thoracoscopic surgery (VATS). ,, Currently, VATS is the approach most commonly used in practice. It has many advantages over open procedures like better cosmosis, improved intraoperative visualization, short postoperative recovery and reduced pain. But, in our case, median thoracotomy was performed as the facility for VATS was not available at our institute. If undiagnosed and untreated, the patient may present with complications like cardiac temponade leading to heart failure, respiratory distress, cyst rupture leading to pleural and pericardial effusion and sudden death etc. In cases of life-threatening presentations, cyst aspiration or emergency thoracotomy may also be required. 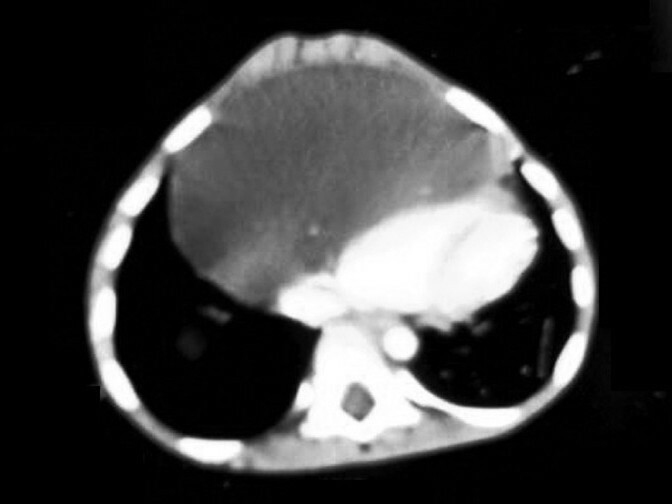 This case of a giant pericardial cyst in a 5-year-old child is being presented to highlight the fact that the diagnosis of pericardial cyst should be kept in mind,in any anterior intrathoracic cystic lesion even though it is very rare in children. Surgical excision becomes mandatory when these pericardial cysts cause ventilatory and/or hemodynamic impairment. 1. Nina VJ, Manzano NC, Mendes VG, Salgado FN. Giant pericardial cyst: Case report. Rev Bras Cir Cardiovasc 2007;22:349-51. 2. Daskalopoulos DA, Kuhn JP, Gingell RL, Pieroni DR. Diagnosis of Pericardial Cyst in a young child by computed tomography of the thorax. Tex Heart Inst J 1983;10:63-5. 3. Noyes BE, Weber T, Vogler C. Pericardial cysts in children: Surgical or conservative approach? J Pediat Surg 2003;38:1263-5. 4. Eto A, Arima T, Nagashima A. Pericardial cyst in a child treated with video-assisted thoracoscopic surgery. Eur J Pediatr 2000;159:889-91. 5. Ozturk E, Aparci M, Haholu A, Sonmez G. Mutlu H, Basekim CC, et al. Giant, dumbbell- shaped pericardial cyst. Tex Heart Inst J 2007;34:386-7. 6. Liaquat HB, Ali L, Ara J. Pericardial cyst: A rare congenital anomaly. Pak J Med Sci 2009;25:1018-20. 7. Varghese TK, Lau CL. The mediastinum. In: Townsend CM, Beauchamp RD, Evers BM, Mattox KL, editors. Sabiston Textbook of Surgery: The Biological basis of modern surgical practice, 18th ed. Philadelphia: Saunders; 2008. p. 1695. 8. Patel J, Park C, Michaels J, Rosen S, Kort S. Pericardial cyst: Case reports and a literature review. Echocardiography 2004;21:269-72. Singh, A.K., Reddy, L., Khan, A., Kamath, C.P., Das, V.